MS. READ, plus sized clothing for curvy-women is giving my Singapore readers a 20% discount on all regular-priced items in their store from now until 30 June 2014! You don’t have to carry any identification or store loyalty card. Just say you want the “wastedfashion” discount and 20% is immediately taken off your total bill of regular-priced items. Go to their Centrepoint store – lots to see and touch, nice and spacious dressing rooms too! Special occasion wear, evening gowns and even prom dresses. It doesn’t matter if you’re big, plus sized or petite, straight size. Dress Sense is extending a 10% discount on all purchases and rental of regular-priced gowns/cocktail dresses for the next 12 months until April 2014! Just tell them you would like the “wastedfashion” discount! Try on before you buy! Don’t be afraid of getting a good deal from an online store when you have SnappyFit! Get a 15% off any SnappyFit.sg items from their website plus a complimentary Express Manicure from Pretty 360 – the nail salon located in the same building (Singapore Shopping Centre). 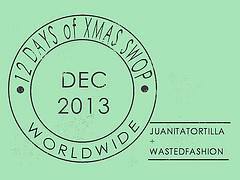 Just mention “wastedfashion” in order to get these privileges when you are paying!